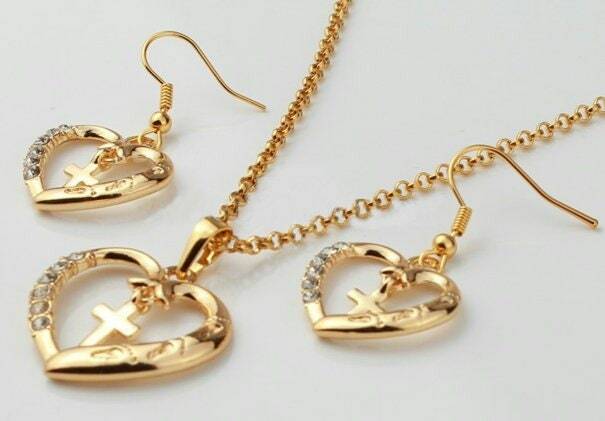 Gold Heart with Jesus Footprints on the side and Cross inside. 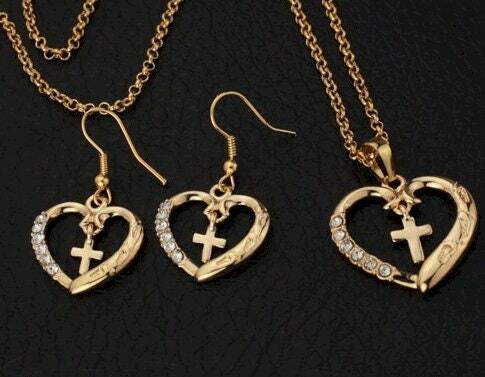 Beautiful Gold plated Heart with inlayed Crystal Rhinestones and Petite Interior Cross. Select Necklace and Earrings. A Saint Michaels Jewelry exclusive. The Pendant heartvmeasures 1". The Pendant comes with a beautiful 18" link chain and positive locking lobster clasp and adjusts to 20". The Earring heart measures 3/4" (1 1/4” with wire) and comes with complementary ear wires and backs.